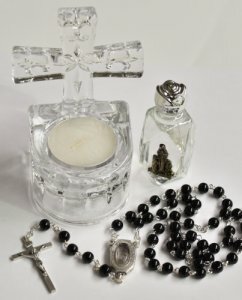 CATHOLIC GIFT SHOP LTD - Holy Water Font & Candle Gift Set. Holy Water Font & Candle Gift Set. > Clear glass cross tea light holder & holy water font, Size:H:4" x D:2 1/2", tea light included.